This Digital to Analog Audio Converter is designed for home or professional audio conversion. 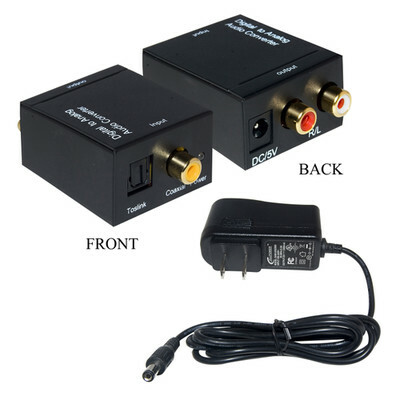 It converts S/PDIF (RCA) coaxial or Toslink digital (optical) audio signals to analog left and right RCA stereo audio. Its compact, easy to install and simple to operate. It includes power supply and user manual. It works as advertised, so far we are very happy with the results. Great product at an outstanding price! Used it to hook up a Blu-ray player (audio only) to stream Pandora through an older Yamaha receiver. Works just fine, no problems. Good product for someone with an older model tv. I'm not ready to buy a flat screen when my big screen works just fine! I am always looking for a "less expensive" solution and this D/A converter fits the budget very well! However, when I hooked up the very first one, it produced a "squeal". I opened up a second box and the unit worked perfectly. Fearing this product would not have a future here at Sound Solutions, I opened the other packages and bench tested them. The rest seem to be fine and I will be purchasing this product again. Works well since my HDTV has only the digital output.